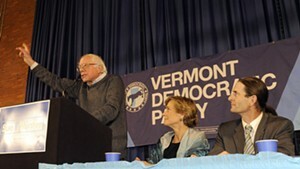 Sen. Bernie Sanders (I-Vt.), left, rallies a crowd Friday night in Montpelier for Democratic gubernatorial candidate Sue Minter and David Zuckerman, Progressive/Democratic candidate for lieutenant governor. 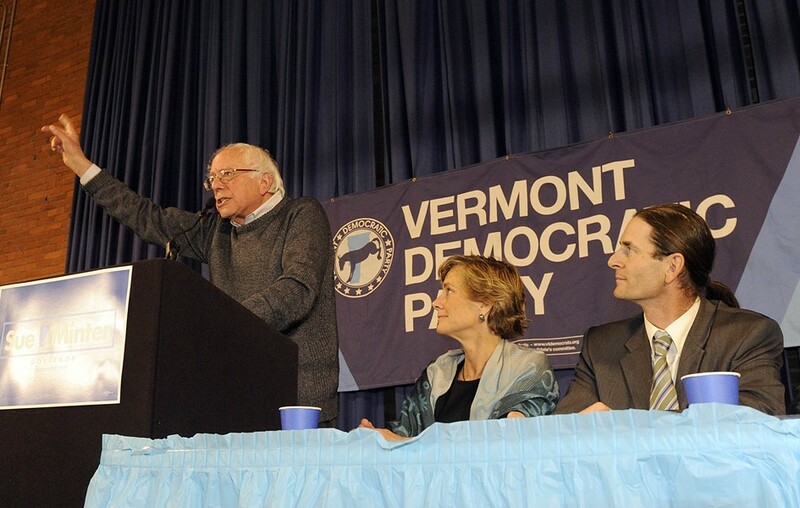 Sen. Bernie Sanders’ (I-Vt.) name isn’t on the November ballot in Vermont. But on Friday night at a political rally in Montpelier, he was the draw. He was greeted by a call from the crowd: “We love you, Bernie!” He drew standing ovations. He was swarmed by selfie-seekers afterward. But the goal of Friday’s rally was to use Sanders’ star power — amplified through a strong but unsuccessful run for the Democratic presidential nomination — to direct the crowd’s attention to the rest of the state’s Democratic candidates. Most of that attention was focused on Sue Minter, the party’s candidate for governor, who is locked in a close race with Republican Lt. Gov. 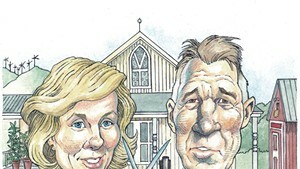 Phil Scott for the open seat. “We’ve got to elect Sue Minter,” Democratic Treasurer Beth Pearce said. “We’ve gotta work hard to get her elected,” Democratic/Progressive state Auditor Doug Hoffer said. “Let’s elect Sue Minter our next governor,” Rep. Peter Welch (D-Vt.) said. “I want you to elect Sue Minter as governor,” Sen. Patrick Leahy (D-Vt.) implored. Minter reveled in the attention, as audience members waved her blue and white campaign placards. It had been a big day for her. Friday morning, she joined Leahy for breakfast with Vice President Joe Biden in Burlington. And it was reported Friday that President Barack Obama had taped radio commercials for her. “As governor, I am going to work hard to carry on Bernie’s fight,” she told the crowd before launching into a list of differences between her and Scott. “We cannot afford a governor who puts a pause button on progress,” she said. Friday’s rally was the first of six that Sanders will lead this weekend around the state. 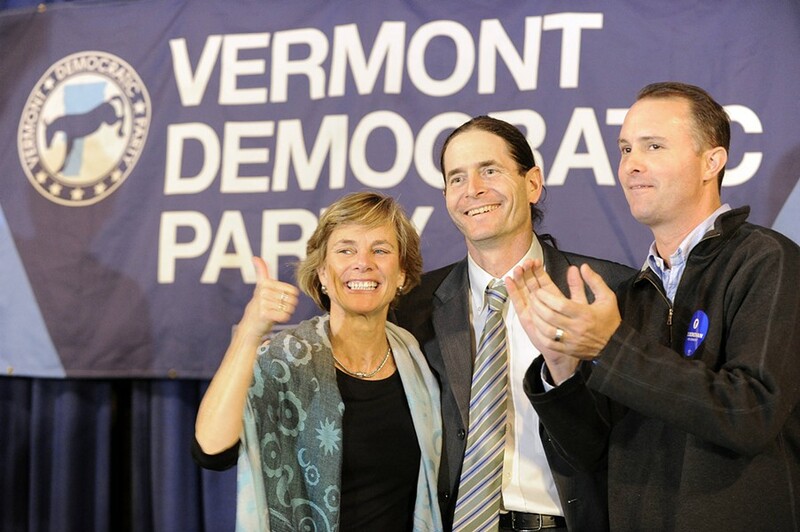 It is the independent senator’s gift to the Vermont Democratic Party, as he praised the full slate of candidates, including lieutenant governor candidate David Zuckerman and attorney general candidate T.J. Donovan. 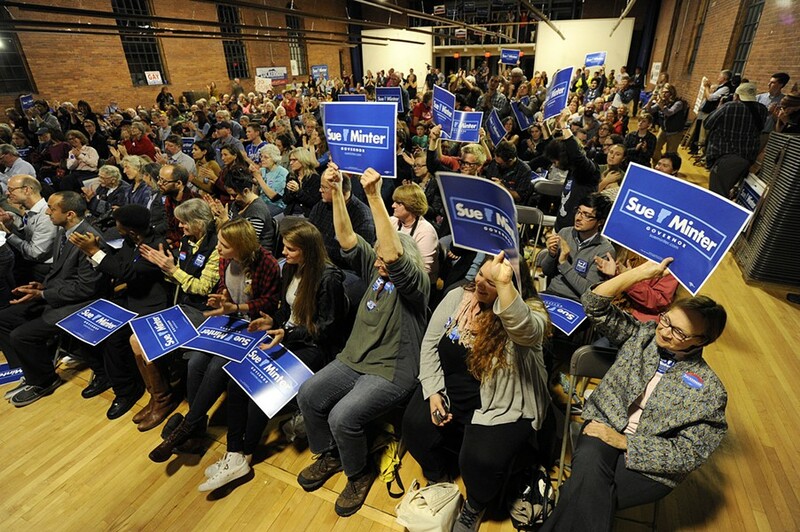 Supporters rally for Democratic gubernatorial candidate Sue Minter. None of the candidates has more to gain than Minter, the former state transportation secretary whom Sanders endorsed just last week. A poll this week, commissioned by Vermont Public Radio, indicated that Minter and Scott are in a virtual dead heat with just more than two weeks to go until the November 8 election. Sanders plans to headline similar rallies Saturday in Vergennes, Bennington and Rutland, and on Sunday in Burlington and St. Albans. He played the same role two years ago as Democratic Gov. Peter Shumlin sought reelection, but after this year’s presidential run, Sanders carries even more of a draw. Whether the rallies help Minter will depend on voters such as Mark Blount, a school administrator from White River Junction. He stopped by the rally because he happened to be in town and heard Sanders was coming. While he leans Democratic as a voter, Blount said he’s undecided in the governor’s race and has paid no attention to the lieutenant governor’s race or others further down the ticket. Blount said he watched a debate between Minter and Scott on WCAX this week. “I think she had a lot of good things and was a little bit at times defensive with Scott,” he said. He likes Minter’s stances on education and the environment, and Scott’s fiscal focus. “I haven’t made up my mind,” he said. Most in the crowd appeared to have made up their minds. They gave repeated standing ovations, were decked out with the full slate of candidate campaign stickers and cheered the call for Democratic causes, from climate change to paid family leave.